Change Agents Extraordnaire. We found 10 more super innovators. Gregory Dubois-Felsmann '77 wa con idered a child prodigy when he was admitted to ew College in 1977 at age 13. Four years later, he became the college' youngest ever graduate after completing degrees in both mathematic and phy ic. Gregory went on to earn both M .. and Ph.D. degree in phy ics from California In titute ofTechnol-ogy. At age 23, he became the fir t ew College alumnus to be awarded a Rhodes cholar hip. Today, Gregory is regarded a one of the world' leading expert in the field of high energy phy ics. As a staff scienti t at Caltech and a member of the executive committee for the Stanford Linear Accelerator Center, he i currently working with more than 600 phy ici ts and engineer at 75 in tirution in 10 different countries studying the relation-hip between matter and antimatter in nature. Lonnie Draper '75 i an emergency physician at Tallaha ee Memorial Hospi Lonnie Draper '75 tal and an a sociate profes sor, emergency medicine, at Florida State Univer ity Col lege of Med i cine. A the president and CEO of Avo care, Lonnie ha invented anATM-like machine that will dispense medication to patients before they leave the ho pi tal. The idea for the product came to him after he pre cribed medication to a patient at three in the morning. The patient remarked that there wa no way she could sit in a pharmacy for two hours with her sick children in tow. Currently 6 1MB WI. TI-l\ 2008 there are three test products being u ed in Tallahas ee, and Lonnie hope to have the product all over the country within the next several year Paul Hansma '64 is the winner of -Paul Hansma '64 the 2000 Biologi cal Phy i Prize from the American Physical Society for pioneering work m imaging biological molecule With hi re earch group, he has developed Atomic Force Mi cro cope (AFMs) for almo t 20 years. Hi research has led to many discoverie in biomaterials. The group's current re earch involve, develop ment of medical diagno tic in trument such as the Bone Diagnostic In trument and Tissue Diagnostic Instruments, whtch mea ure bone fracture nsk in living patient More d tails are on his group' web ite: http:/ /hansmalab .phy ics.uc b.edu/ Steve Jacobson '71 ha worked for the past 29 years building scientific in struments and the past 12 year teaching engineering n1dents how to design and build things. He wa part of a team at orthwestern University that created the Uberwalker, a body weight upported treadmill Steve Jacobson '71 training system designed for home use. A cost-effective and simple accessory to any standard treadmill, it can be used by tho e suffering from obe ity or recover ing from orthopedic surgery, stroke and other ailments to accelerate rehabilitation and regain the ability to walk. In 2006, it was the winner of the Davinci award that "honor. out tanding engineering achieve ment ." In addition, teve has spent 28 years developing recumbent bicycles that fold up to fit into a suitca e. He has sold six so far, and would like to be building and elling many more. Sharon Matola '78 i founder of the Belize Zoo and Tropical Education Sharon Matola '78 in Belize Center, begun in 1983 to protect exotic animal and now featured in a documen tary film. lt is currently home to more than 125 native Belizean pecies and in-truer people about wildlife ami how to care for it. Sharon' life story-in particu lar her struggle to stop the Chalillo dami documented in the book, The Last Flight of the Scarlet Macaw: One Woman's Fight to ave rhe World's Mosr Beaunful Bird (2008), by Bruce Barcott. Called "the Jane Goodall of Central America," Sharon ha worked more than 20 years to develop thi w rid-class zoo, and it i now con idered a platform to implement criti cally important con ervation work. lEWS Legacy Admissions at Liberal Arts Colleges: Where do we stand? Approaching its 50th anniversary New College ponders the occurrence of legacy admiss i ons. By Raymonda Burgman 91, NCAA Board D i recto r A a tudent at a liberal arts college that wa new, in a chronologtcal en e, I never thought to a k any of my cia mate if their parent!i, grandparent! ;, aunt uncle or siblings attended ew College. Furthermore, what difference would it make? Well, now I teach at a liberal art college that i old, founded in the 1 30 and every year I wonder about whom the tudenr sitting in my cia e know, or rather with whom they hare blood. I know that there ar varying opin ion about legacy admiss10ns, a practice described by ]arne Monks, University of Richmond as istant profes or of economic, whereby "college and uni ver ity admi ions director give pecial con ideration to applicant who! e) relative attended the in titution." orne ay that a strong and pronounced legacy admi ion policy i affirmative action that preserve a predominantly white po tsccondary educational y tern. Thi policy al o blurs pol i tical party line. Both Pre ident George W. Bu h (R) and enator John Edwards (D-NC ) poke loudly as l egacy oppo nents. Other believe that u ing legacy a an admi sion factor makes for good bu ines A lumni are more likely to give to an in titution that they feel is looking out for their best inte r est, educating their sibling nieces, neph ew child r en, and grandchildren. From an in t i tutional per pective, legacies come f rom fami lies that value education. A rudy at Duke Univer ity by athan Martin, graduate student, and Kenneth penner, ociology profe or, found that !ega ie do not outperform students with imilar family profiles. With any policy, there are winner and loser but there need to be more clarity-with legacie there i haze to di cu With 50 students who were hildren of or related to alums expre sed intere t in admi ion. Yet, approximately 88 percent of the legacie who applied, during thi five-year period, received admi sion to the college, but le than 45 per ent of tho e submitted paid depo it I admit that the number are more tudent!i from under represented groups at tending< nd completing college, it i ((Do you grow from within, pulling from a known stock of educated and previously ritualized students? Do you look outside your college family for the next po ible that not ju t afflu ent white tu dents benefit skewed, calculating over a five-year pan and l acking compari on to the overall application/ acceptance rate. Yet, in uch lean fina n cial times, we must ask, what is the right pa t h for ew College? Other college such a tephen College in Mi ouri, used tion of unknown scholars?" legacie to revive lumping from legacy admis ion The troubling and confounding part of thi tory comes from the United tate Cen u Bureau that reported in January 2008 that only 19 percent of blacks and 13 percent of Hi pani 25 year of age and older hold bache lor' degrees. The question here is how underrepre ented groups can take advantage of legacy ad mission if their matriculation rate are lower than their white counterparts are. What should we do about legacy admis i ns? At New College, in com parison to other liberal art college e pecially private one t h e l egacy numbers are tiny but the admi ions rate is high. Fr m 2003-2008, less than enrollment number They marketed to their alumni in a n vel manner ending baby clothe embla zoned with the university in ignia to alumni with n wborn houl d we look to pee r and asp ira t ion college for an wer ? Middlebury College i n Vermont had a l egacy ac ceptance r ate aro u nd 4 8 percent, and Bowdoin College in M aine had a legacy acceptance rate of 40 percent. Each school had overall acceptan e rate around 18 percent. When familie are loo k i n g for fina n cia l value and aca demic re u lts from co ll eges and univer sit i e and college are competing with other in titutions for the be t tuden t w hat is the best way to p r oceed? Do you grow from wit h in, pulling from anywhere in the world by email? ave resources by signing up for an electronic 1mbus. It looks just like the paper Nimbus, only greener! If you're interested, emad NCAlum@ncf .edu with the a known rock of educa ted and previ ou ly r i tualized student ? On the other hand, do you loo k out ide your co l lege fami l y for the next gene ration of unknown cholars? I I GO GREEN ... subject "go green" and don't forget to include your current email addre s!! I 11MR WI TER 20 tj FOR NIMBUS! PROGRAM UPDATES Alum Fellowships NCAA proudly pre ent our 2009 Alumnae/i Fellows: Alexis Orgera '95 and Kelly Samek '94. Kelly will be returning to campus to teach an lSP pe riod cia on coa tal law and policy and Alexis will teach a semester-long course in contemporary writing. Kelly write "Coastal Law & Policy is designed a an inten ive four-week course exploring that vast resource and human habitat known as "the coast." The cia swill focu on the legal framework that exists on the federal, tate and local level to regulate the usage and pre erve the utility of the coast. The coursework features a host of topics-from port management to ubmerged lands development to marine protected areas-meant to serve as lense through which to examine K elly S amek '94 society's in teraction with the coastal zone. With visit to local sites such as an aquatic preserve and a working water front, the students will hopefully determine for themselves what informa tion deci ionmakers need in order to promote the development, protection, and sustainability of coastal r e ources for future generation Alexis write orne of my best memories of New College reside in the dark, cluttered, bnttle-paper smell of the New CollAge maga zine office where we put together gether a class called "Re urrecting New CollAge: Literary Criteria and Editorial Decisions." My goals for the course are to facilitate an understand ing of our contempo rary literary world, to encourage innovation Alex i s O rgera '95 and u rainable practice, and to develop a working system for a resurrected New CollAge. Beginning with a crash cour e in the fundamental of poetic craft and analy sis, and buildina into a publishing lab in which students discuss, conceptual ize, research, and implement literary magazine production practices, the clas will culminate (hopefully) in an is sue of New ColLAge as well as providing extra guidance and support for current campus pub l ications." Mentoring Program The first seme ter of this year's Mentoring Program was well received by alum I students, parents and staff. CAA held four Coffee Talk sryle e ions where alum hared their personal career advice and expertise with interested students. Collaborating with Student Affairs, NCAA al o held an Alum Panel Q&A and networking session during Family Weekend. For our first Coffee Talk, Interna tional Business & Finance, Henry a little gem of a zine under the tute lage of Mac M iller. When Mac retired, so did New CollAge. With these things in mind, J put toC i ndy Hill Ford '89 wit h st u dent s at the Law Cof f e e Talk 14 WINTE R 2008 myth '76, hared hi experiences in 25 years of banking and investment management, a timely subject. Our alum attorneys Cindy Hill Ford '89, Dave molker '72, and Robert Lincoln '77 drew a crowd of aspiring tudents for the law mentor session Our next Coffee Talk, Environmen tal Busines featured Mike Burton '86 corporate leader of Wilson Miller Eco logical and Water Resources division. ln collaboration with the Gender and Diver ity Center, NCAA invited board member Ray Burgman '91, to peak on Diversity in Education in the next mentor session. Ray is Asst. Profes sor of Economics at Depauw University as well a Special Advisor to the Presi dent for Faculty Initiatives. John Cra n or '64, Julia Burch '98, Mary Rul z '73 student Evan Axe lrad '04 Our Alum Panel and etworking Gathering during Family Weekend featured Mary Ruiz '73, CEO of Manatee G len Hospital and Addic tion Center; Julia Burch '98, Public Outreach Coordinator for Sarasota Bay Estuary Program; and John Cranor '64, former CEO of New College Founda tion, along with current the is student Evan Axelrad. The panel discussed among other thing 1 the proverbial 'life after New College' in a Q&A with students and their parents. A networking session with local a l ums followed. A few concerned parents were converted. See more mentoring photos in the Event Photo section on page 19! B A C K P 2009 Reunion of the Charter Classes! Celebrating the 45th) 44th) and 43rd Anniversaries of the Charter Classes: 1964) 1965) 1966 -October 23,25, 2009- Campus Tours & Interviews for "Tell Your NC Story" Welcome d i nner at College Hall Breakfast with the Berggren s Alumnae/i College Mini-seminars 50th Anniversary discussion at The Keating Center Stay tuned for more updates from NCAA in the spring! 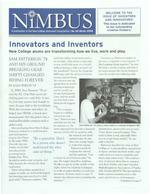 NIMBUS New College Alumnae/i Association New College Foundation, Inc. 5800 Bay Shore Road Sarasota, FL 34243-2109 Nonprof it Organizat ion U.S. Postage Pai d Permit #500 Manasota, FL NIMBUS Published by: New College Alumnae/i Association The Keating Center 5800 Bay Shore Road Sarasota, FL 34243-2109 Phone 941-487-4900 www.alum.ncf.edu Editors: Susan Burns '76, Jessica Rogers and Claire Michelsen '03 Nimbus is published three times a year. Unless otherwise noted, opinions expressed are those of the authors and do not represent official policy of the Alumnae/i Association or the opinions of the editors. New College Alumnae/i Association is an affiliate of New College Foundation, Inc. an independent not-for-profit Florida corporation that has been qualified by the Federal Internal Revenue Service as an IRC 501(c)(3) organization. The IRS has also determined that New College Foun dation, Inc. Is not a private foundation within the meaning of 509(a) of the Code. The tax-exempt status of New College Foundation, Inc. has not been revoked or modified. New College Foundation, Inc. is listed as a qualified organization in IRS publication 78 (Revised Sept. 30, 2000), Cumulative List of Organizations, Catalog Number 70390R, page 852. A copy of the official registration and financial information may be obtained from the Division of Consumer Services by calling toll-free 1-800-435-7352 within the state. Registration does not imply endorse ment, approval, or recommendation by the State. Since New College Foundation does not engage professional solicitors, 100 percent of all gifts are received by the Foundation. The State Registration Number for New College Foundation is SC-00206. The Federal IRS Identification Number is 59-0911744.